Blue Orthodontics: Who will be the LUCKY patient? Who will be the LUCKY patient? Look what you can win at Blue Orthodontics!!! We recently launched an amazing incentive program for sending your friends and family to Blue Orthodontics.......Why???? Because we would be honored to serve YOUR loved ones! We truly love getting to know our patient's and welcoming new members to the Blue Orthodontics family. One of the greatest compliments we can receive is to have a family member or friend of our patient's sitting in our chair!!! 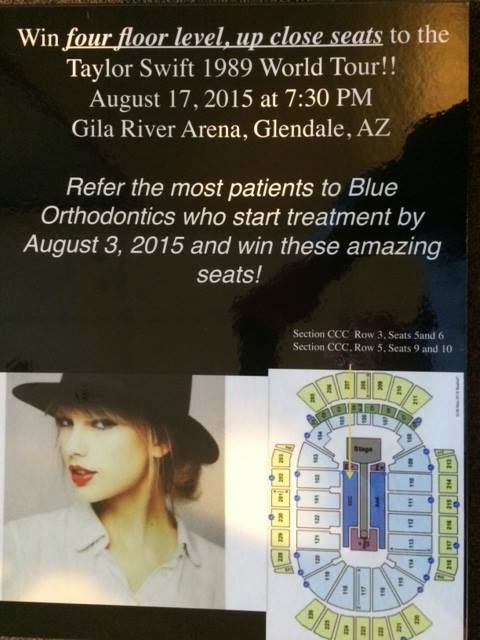 **Whoever refers the most people to us that start treatment wins FLOOR SEATS to see Taylor Swift!! **You should also tell your friends and family that the consultation, x-rays, exam and pictures are all COMPLIMENTARY!!! So even if they are unsure its not going cost them anything to come visit us and get a definitive answer!! JUST LOOK AT HOW CLOSE YOU WILL BE TO THE STAGE!!! WHOA!!! !